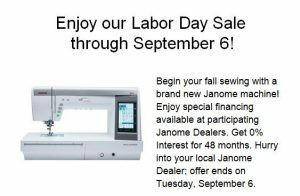 The other day I got an email from Culcita saying they were raising the prices of Sew Tites. Like a sucker I bought more. OK, I am not really a sucker. I like this product. 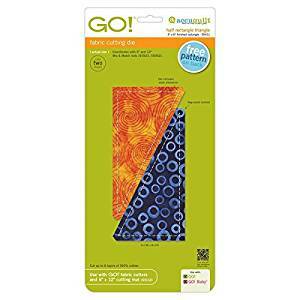 I got my first three free at QuiltCon last year and I found them to be incredibly useful for bags and sewing with vinyl. 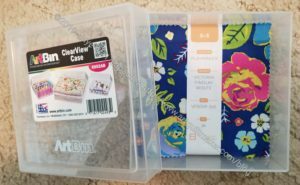 These fill in the gap where WonderClips won’t work. I bought a 15 pack thinking I would disperse them around my various bags so I would have them handy when I needed them. Sew Tites are magnetic and fall somewhere between a pin and a clip. One half goes on the top of your piece and one half goes on the bottom. There is nothing pointy or sharp which is why they work for vinyl. I think they would also work for something thick like Soft & Stable. I can’t remember if I have tried that or not. The other night I was, once again, fighting to line up my half hexie EPP project. The tips need to be in just the right place. I remembered I had received the Sew Tites. I went up and got a few and tried them out. 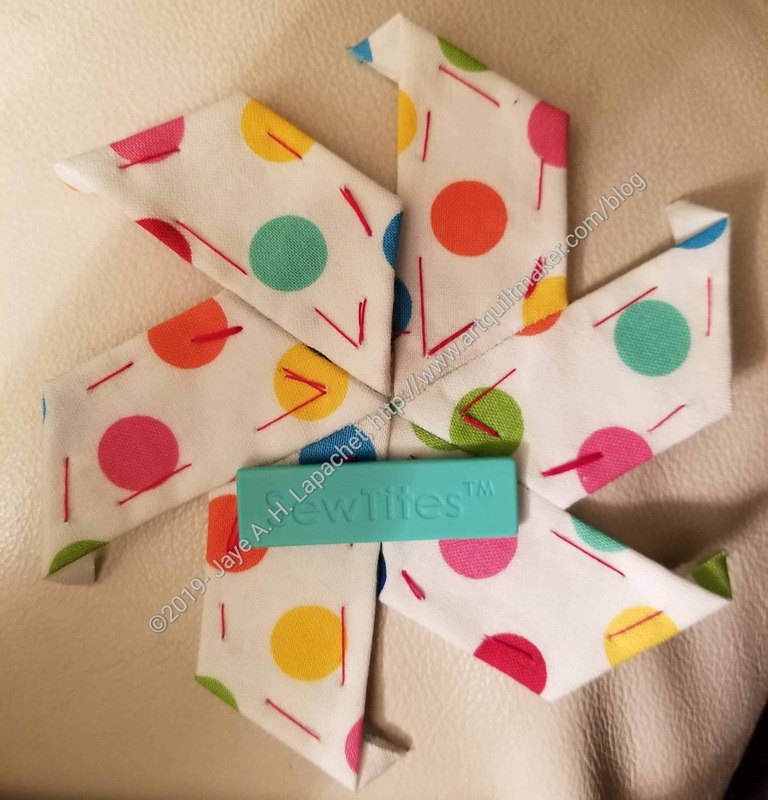 I was putting half hexies together to make stars. I use a ladder stitch (or an approximation thereof). The trick is to keep the two legs next to each other in the correct position long enough to sew them together. This is really tricky since I only have two hands. 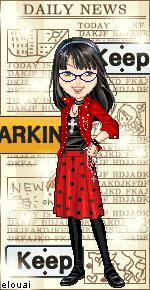 I have been using WonderClips. They work okay but not great, especially for the inside angle. The Sew Tites aren’t perfect either. They are a little hard to maneuver to get the pieces to stay where you want them. Still, once you get the Sew Tites in place, they stay put. Thus, your pieces stay put. 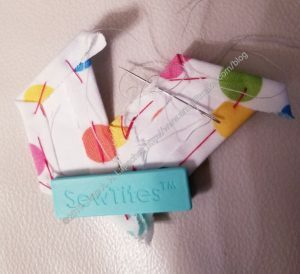 The Sew Tite are kind of large, so I am only able to hand sew half of my seam before I remove the magnet. Half is enough to ensure that I can keep the two half hexie legs together the rest of the time needed to sew the seam. The magnetic Sew Tite can also straddle areas of piecing where there may be no fabric or paper to which to cling. 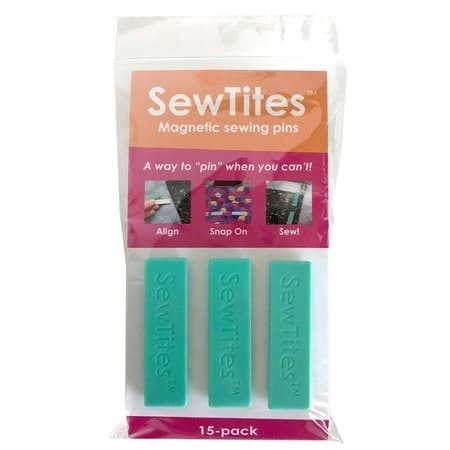 Unlike a WonderClip, which needs something on which to clip, the Sew Tite sticks to itself. In the second EPP picture you can see that there is a space on the inside angle where there is no fabric or paper. 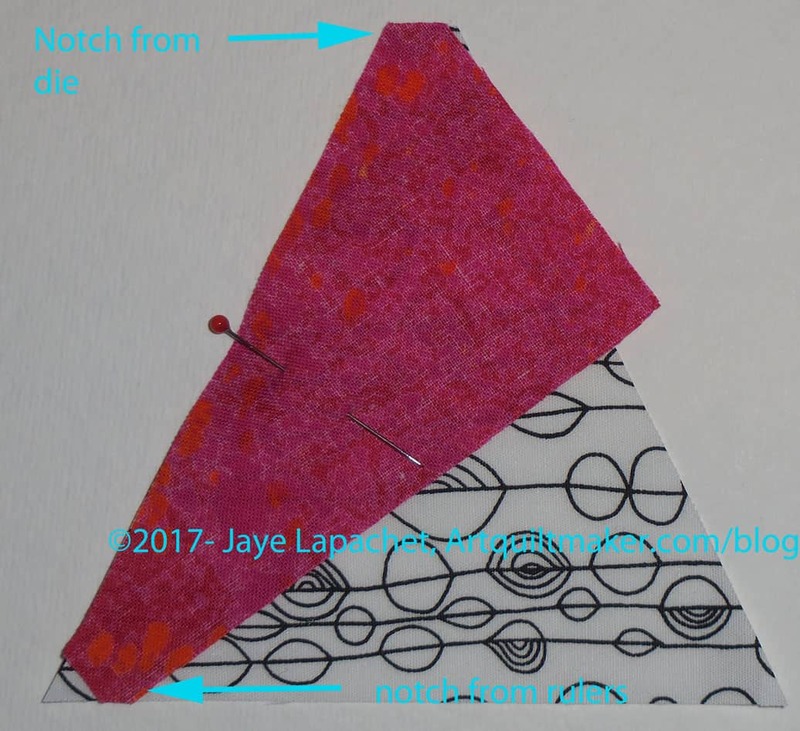 The ends of the Sew Tite are on paper and fabric while the middle sticks to itself. There is no problem and they still hold the pieces together. There is a benefit as well. 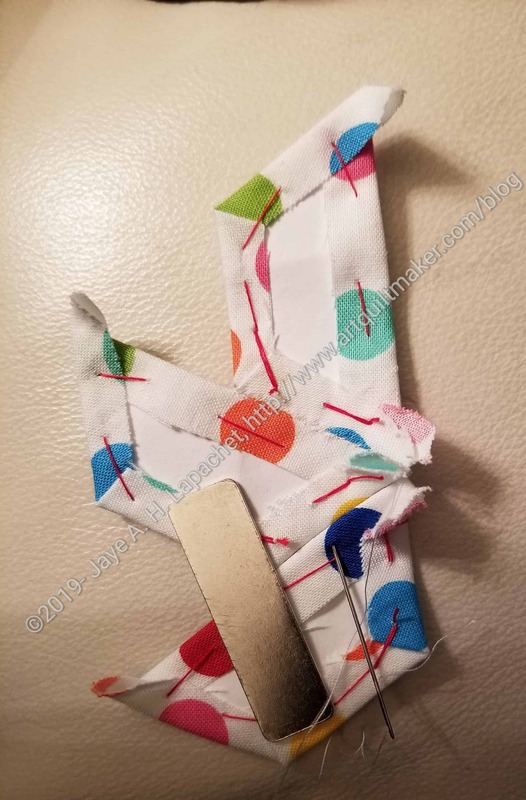 The farther down I can place the Sew Tite and still have it hold, the more of the seam I am able to sew without moving or removing the Sew Tite. I have also been struggling with getting the centers of the stars to line up. Sew Tites work for this problem as well. Again, once the pieces are lined up, the Sew Tites hold them in place. 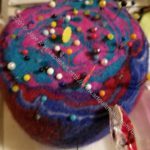 I have been wanting to tell more people about them in the Crafty Gemini Facebook Group, but there is a prohibition against talking about other products. Oh well, I assume people will hear about them eventually. Check out the Culcita/Sew Tites website for videos and more information. Now that I seem to be okay with starting new projects, quilts are being thrown in my path in such a way that I can’t seem to say no. 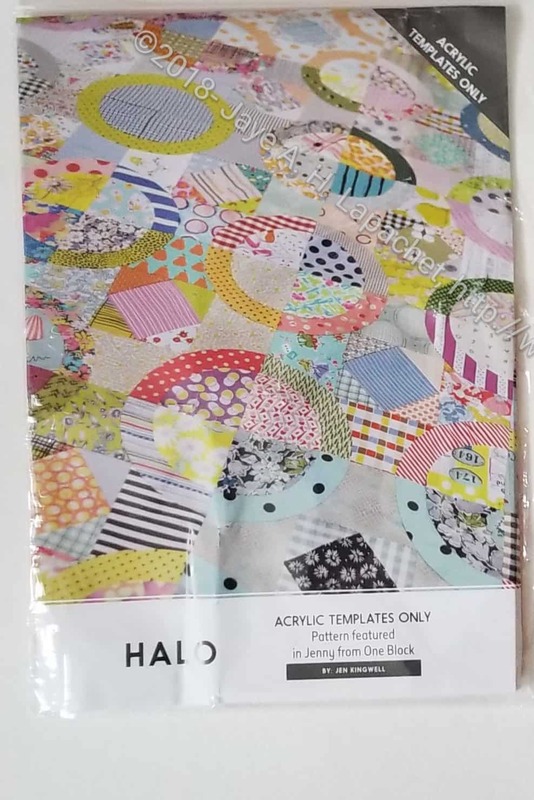 The official name of this quilt is Halo Top. 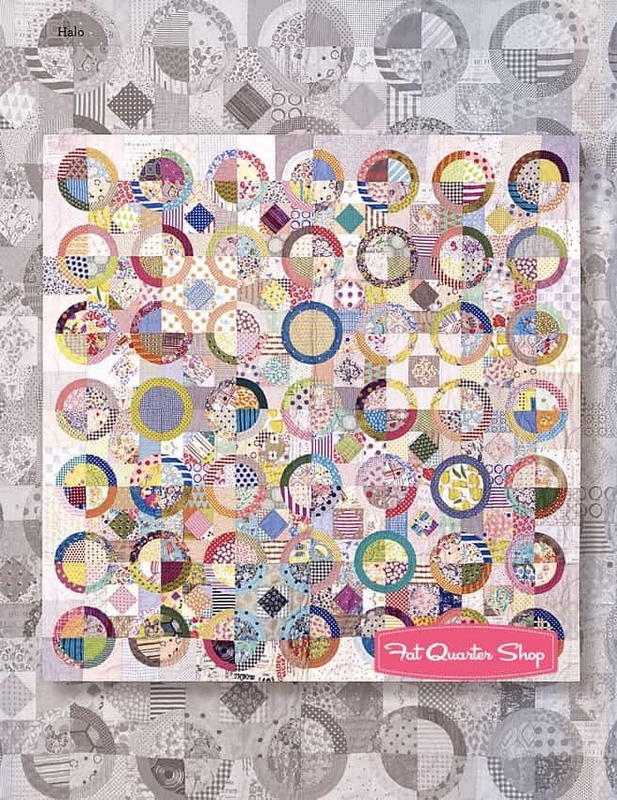 I plan to call this quilt Ring Toss, once I get around to making it. I am not a fan of the word Halo in very many contexts and this is one I don’t like. Ring Toss sounds like a circus and fun. 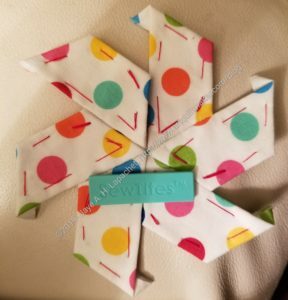 The other thing is that the pattern is referred to as “Jenny from One Block.” I really don’t know what that means and haven’t had any luck with Google yet. There is a lot of cutting to do, which, as I said, requires some Hunting & Gathering, so I might not get to it immediately. I went out and searched the web for photos of the blocks to get some ideas. I came up with one from A Crafty Fox that was helpful. It is easy to see the block structure from this photo. Fat Quarter Shop had a photo, which was interesting as well. 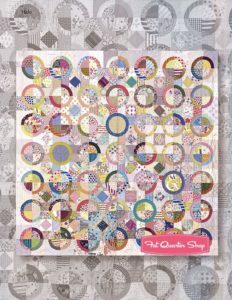 It showed a grey quilt in the same pattern under the brightly colored scrap quilt. It made me think that a monochromatic border might be interesting. I’d have to work hard at showing contrast. 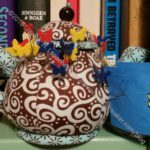 The other day I wrote about the pincushions I use when I am working. I didn’t exactly lie, but I was mistaken. I actually have 5 (yes, FIVE) pincushions and I use them all, though the two I discussed the other day get the most use. My workroom isn’t that large and it is full of books and fabric and desks, so there isn’t really much floor space. I could walk around carrying a pincushion, but I don’t. Apparently. 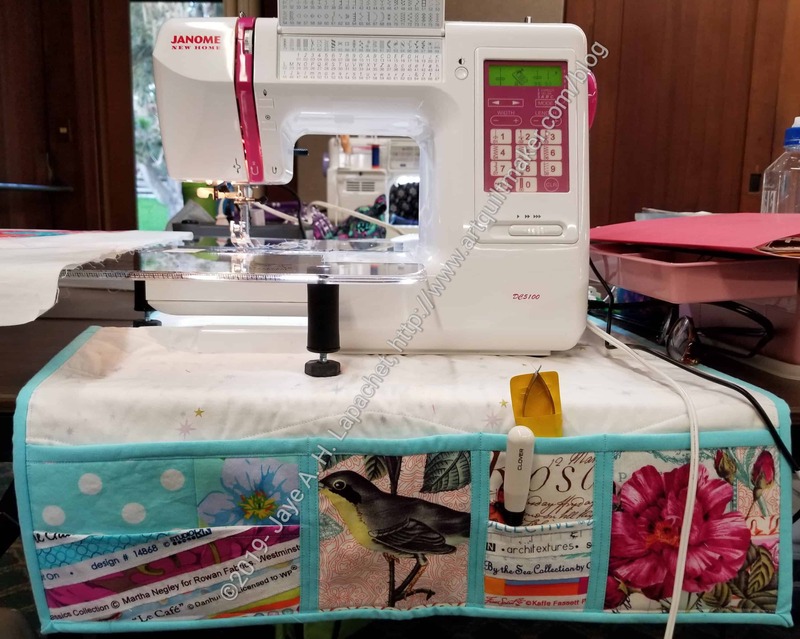 In addition to the two that move between my sewing machine and cutting table, I have one on the bookshelf above my ironing board, one next to my design wall and one that travels with me. These three extras are where they are because they were given to me as gifts. I used to have a hand me down tomato pincushion, but people kept giving me cushions so now I am up to 5. I am not sure what I’ll do if I get any others. The sad part is that pincushions are so great. There are so many fun shapes and great patterns for them. Anyway, the teapot pincushion is one that I keep on the bookshelf above my ironing board. It is a fun shape and those pins are my least favorite. 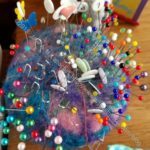 Oh, the butterfly heads are fun, but somehow I just don’t like those pins. They don’t get much use as I only use them when ironing and I usually have to be desperate. 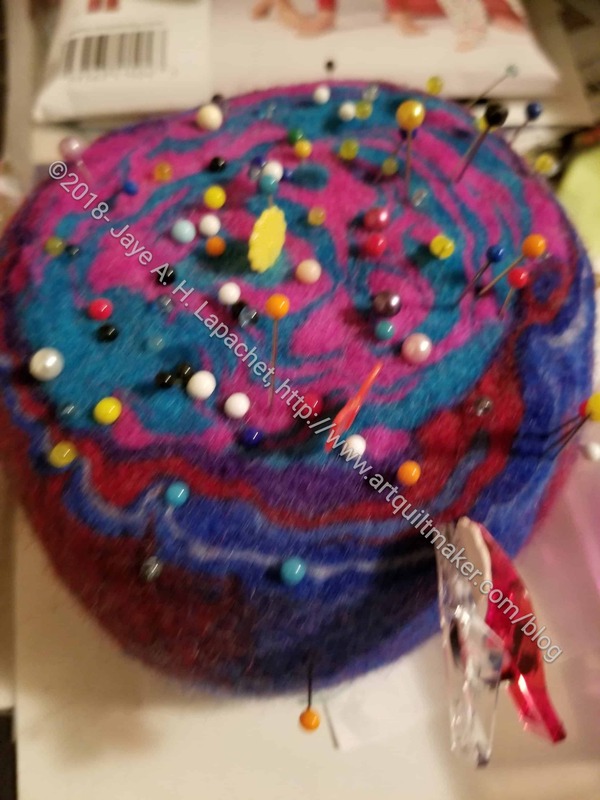 The design wall pincushion is another wool felt pincushion. It is a great color and very swirly and fun. I put in near the design wall, usually so I can pin quilt tops to it when they get too heavy for the flannel. I used it, and the pins quite a bit for the Stepping Stones n.2. The pins come in very handy when I am desperately trying to keep a top on the wall. It is annoying that the design wall fabric won’t hold a whole top. The travel pincushion is essential. 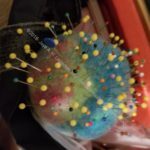 I have doubles of everything all packed and ready to go at a moment’s notice and the pincushion is no exception. 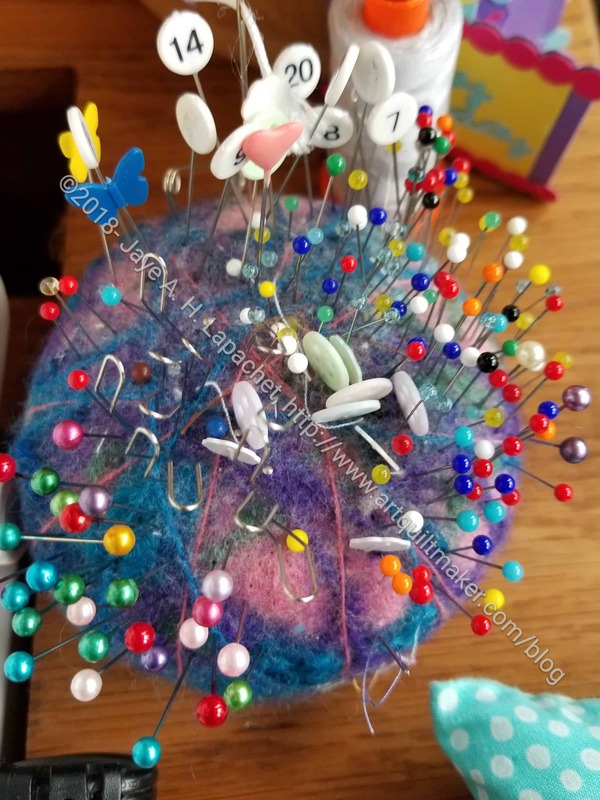 I completely used up all the pins in my travel pincushion between Sew Day on Saturday and the Rosalie Dace class. 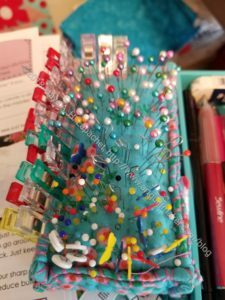 It was crazy to see this pincushion empty. A lot of my pins are taken up with the City Sampler blocks, but the others were just engaged with different projects. I was able to reclaim some so the pincushion does not look so desolate. As you can see from the variety of pins, I have a lot of different kinds of pins. My favorites are Dritz Pearlized Pins. Of course, I love the colors, but there is something about them that works for me. They are not the thinnest or the longest, but they do work well for me. I was back in the workroom on Sunday and the pincushions caught my attention. I thought that I would share the way I work with them. 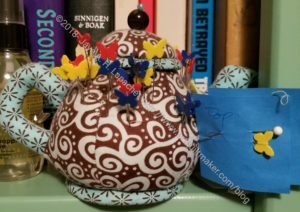 I have two pincushions that I use. 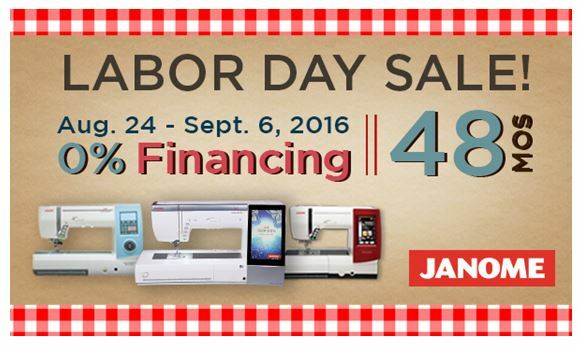 I keep one next to my sewing machine and one on my cutting table. I could move one pincushion from one place to another, but I received a second pincushion as a gift and thought of a new system. 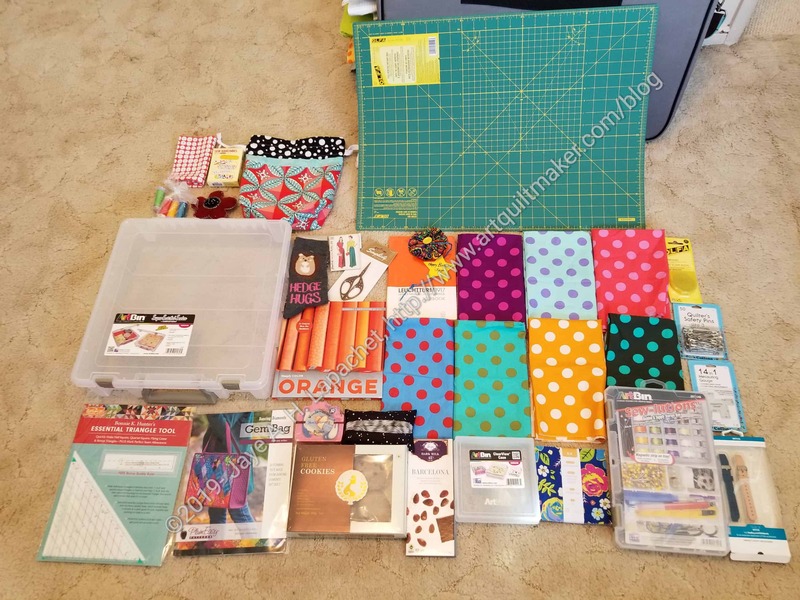 When I start with pinning things together, I often pin on my ironing board or cutting table. It is very convenient to have the pins handy. Lately, I added some WonderClips to the side. I needed them handy on the cutting table. 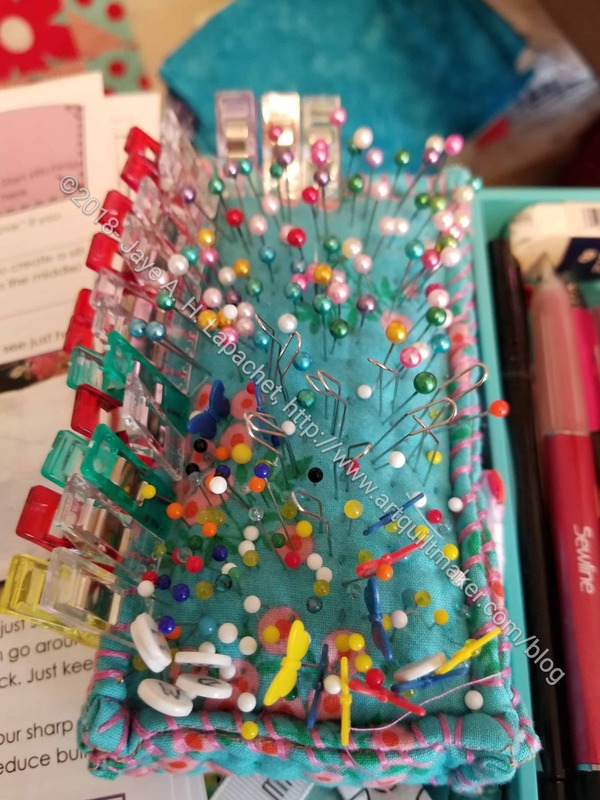 The rectangular pincushion is on my cutting table right now. One of the pincushions sits next to my sewing machine. As I sew I have pincushion handy to put pins in as I remove them. The wool felt round one is currently next to my sewing machine. That’s my system. I hope it helps. I mentioned on Twitter (see sidebar if you want to follow me) that my Oliso had started to have problems. I could deal with them for awhile, but the poor thing just became exhausted and confused and I had to reach out for tech support. Tech support for an iron sounds weird, but I think that is what it is. Oliso’s tech support is great. You get the same person each time (perhaps they have only one person and not a lot of problems? ), which is important to me. I really dislike having to go through my problem each time I reply to a support ticket entry. Ryan, the tech person, told me how to reboot my iron (crazy, right?) to get it’s brain back in order and when that was not a long term solution, he worked with me to get the iron fixed. Oliso irons have a warranty, but mine was old, so it wasn’t free. I think I have had the Oliso for 3 years. I know I bought it on MassDrop. Ryan, my new friend, didn’t care where I bought it, which was nice. I got a deal on the repair, but I think what happened is that they just sent me a new one. It is exactly the same as my old one and works great. As you know I can’t sew without an iron. I have a Sunbeam as a backup and for DH to iron whatever he needs to iron. I used it as a test to determine if I needed a replacement Oliso or if I should go back to buying cheap irons. My iron strategy used to be to buy a cheap iron at Target whenever I had iron issues. Sometimes, my stepdad can fix the cheapies, but not always. The Sunbeam was fine, but having to sit it upright every time was a hassle. Yes, #firstworldproblem, I know. I like the stability of the Oliso always being in horizontal position. The iron sits on the ironing board next to the bathroom door, so there are a lot of opportunities for it to get knocked off. It has happened. Still, the Oliso is pricey even at the reduced rate I got for the repair. The horizontal position is, I realized, also good for my hands and wrists. 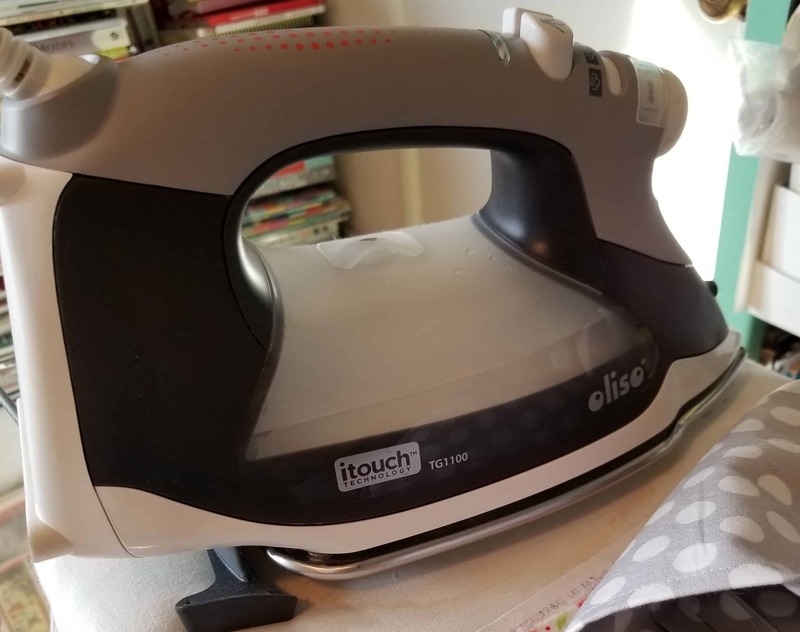 That little bit of extra weight can make a difference if my hands are hurting me, whereas sliding the iron over to the units or fabrics is not completely weight free, there is little wrist flexing involved and every little bit helps. I decided to pay the money and get the Oliso repaired. It is back in action. The Sunbeam is put away for stand-in duty in three years and everyone is happy. I am not affiliated with Oliso. Just a happy customer. *ColorPlay and the Spark series will return. 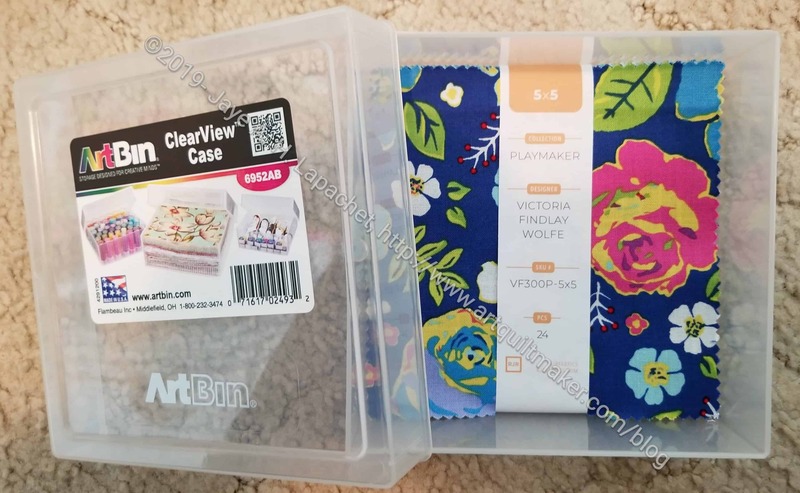 I first mentioned tracking my fabric usage formally on a V&S post a few months ago. Peg recently asked about it, so I thought I would write more about it. 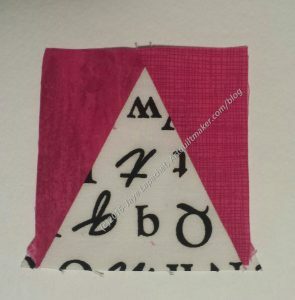 First, if you are a beginner, stop reading and go sew. You are too young a quiltmaker to be worrying about fabric usage. Second, if you are prone to anxiety, stop reading. Fabric usage is not something you need to add to your list of anxieties. 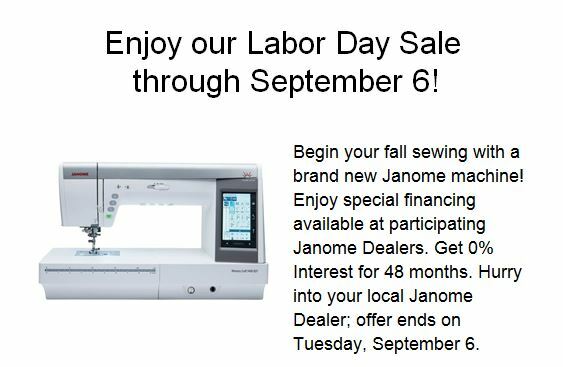 Go sew and enjoy your quiltmaking. 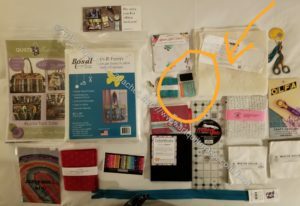 Everyone else may continue reading with the understanding that this tracking system is not to judge, but to understand how much fabric my projects actually take and my fabric usage over the course of a year. I use a spreadsheet that I originally got from Pam of Hip to Be a Square podcast. I have modified to suit my needs. 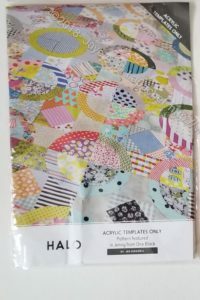 Pam has a blank copy of her fabric usage spreadsheet available on a post from a few years back. It is a good way to start tracking your usage as long as there is no guilt involved. 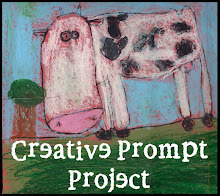 Cheryl, a BAMer, wrote a great post about her spreadsheet for the BAM blog. She talks about her theories around it, why she does it and how she does it. While there is no shortage of fabric at my house, this spreadsheet is not intended to keep me from buying fabric. That would be a effort in futility and acknowledging that fact feels like a victory. 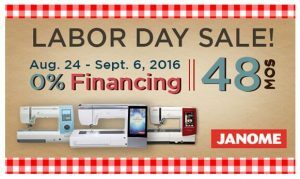 I started so I would know how much fabric I am using per year as well as how much I am adding to my collection. 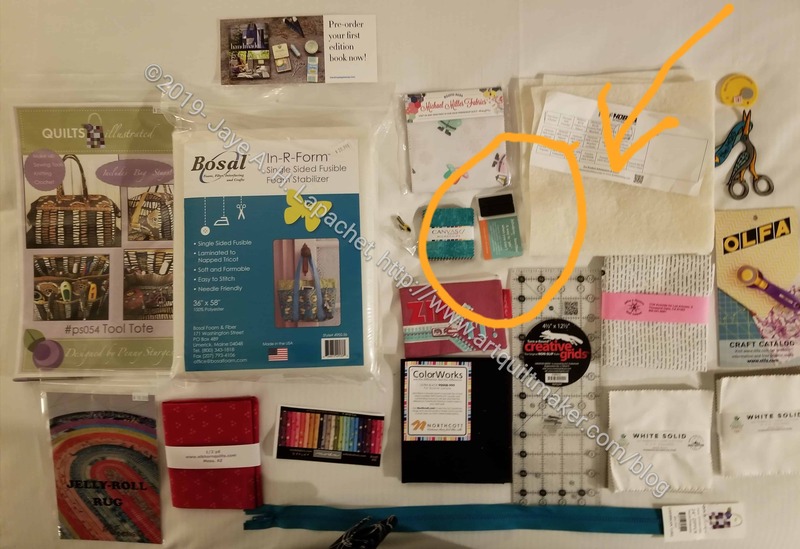 I have a good idea of how many different fabrics I purchase in a year based on the Fabric of the Year quilts, but quantities were always a mystery. There is no adjustment for how much fabric I have purchased and that changes the numbers a lot. The numbers above are gross, not net. 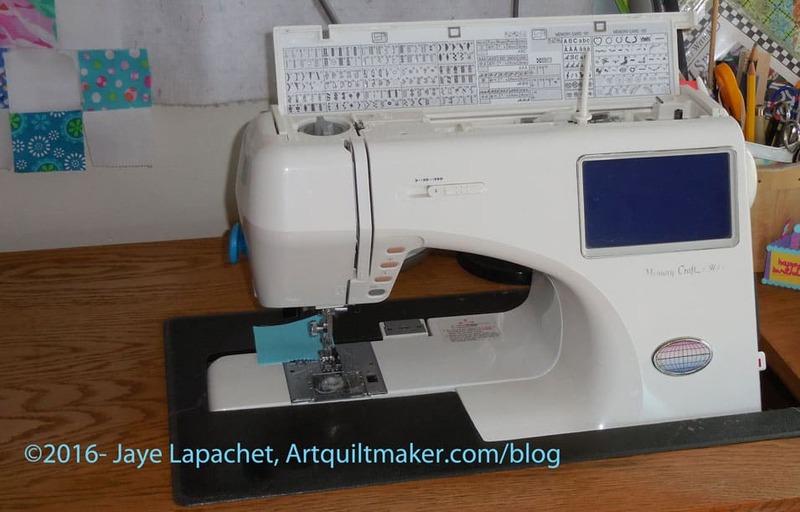 I have to say that knowing how much fabric I used in 2015 spurred me on to sew more in 2016. Using a 100 yards is not out of the realm of possibility and if I made goals like that, that would be my goal. Less than halfway through the year, I am already well on my way. I find the statistics interesting, but I don’t think you should track your fabric usage unless there is no guilt involved. OK, smackdown might be a bit of an exaggeration, but it sounds impressive, right? I am working on the Bonnie Hunter En Provence Mystery Quilt, as you know. The second step, which I have partially finished, uses Peaky and Spike* blocks. Peaky and Spike sounds more fun than “weird triangle blocks”, right? Peaky is the pink part and Spike is the black on white part. For En Provence, I needed to make 100 of these elements. Not rocket science, but not squares either. The bias could be problem. 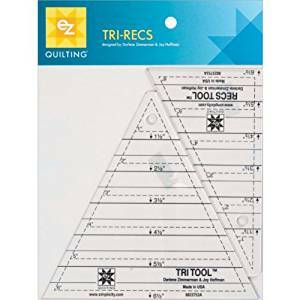 At Sew Day I cut all of the Spikes using the appropriate Tri Recs ruler. This piece has no notches except for the top, which is easy to deal with. I bought the Peaky and Spike die with a gift card for Christmas, but by the time I was ready to start cutting, it was still on backorder and had not shown up. I began cutting the Peakies from the ruler at Craft Night. SIL told me that she had the Peaky and Spike die and I switched to that. I cut all of the 200 Peakies I needed in about an hour. Much easier than using a rotary cutter. The interesting part of this is the sewing. The ruler has a notch at the bottom (photo right bottom) and the die (photo left top) has a notch at the top. In the directions for the quilt, Bonnie admonishes us to be sure and cut the notch at the bottom**. As a result, I placed the ruler on the die cut Peakies and also cut the bottom notch. This got old really fast and I stopped. Once I started sewing, it didn’t matter. The bottom notch (from the ruler) was certainly helpful. You need either the top or bottom notch to sew the pieces together easily and in alignment, however either one will work. I really didn’t need both. 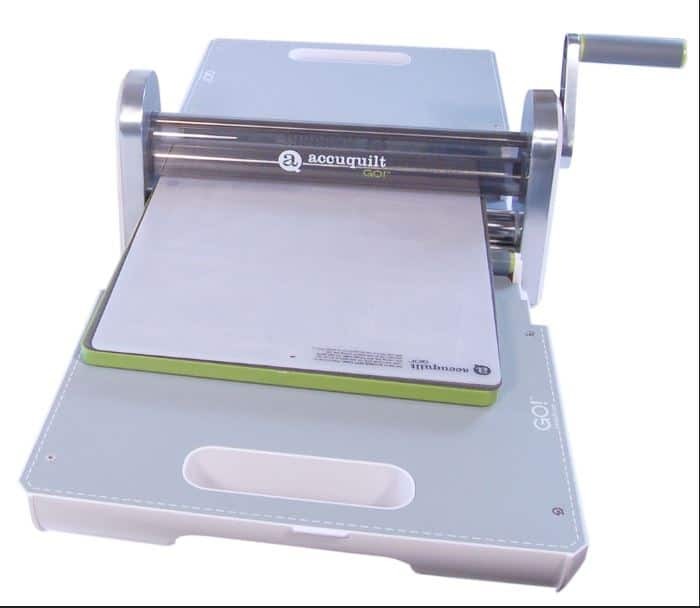 The ruler has the advantage of enabling the user to cut multiple sizes. The Peaky ruler has the notch on the bottom because of the different sizes. The die only cuts pieces for one block size, and, thus, can have the notch more prominently on the top. This was a interesting learning experience. *Peaky and Spike is the name given to these blocks by Doreen Speckmann. Doreen was a fantastic teacher, funny, fun loving and a master at helping students understand the structure of block elements. If you don’t have her book, Pattern Play, start haunting used book stores. It is a classic. **The mystery quilt directions focus on the Tri Recs ruler and not on the die, though the die is mentioned as being available. 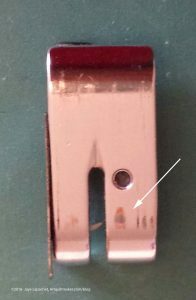 Well, from the”you learn something new every day department” comes word that you CAN wear out sewing machine feet. The 9k has been acting up. Not badly, but like an old lady who wants attention. First, something electrical with the light went wrong pretty soon after I brought it home. I know it wasn’t the bulb, because, for a time, if I tapped on it, the light would come on, stay on for a bit, then go out. 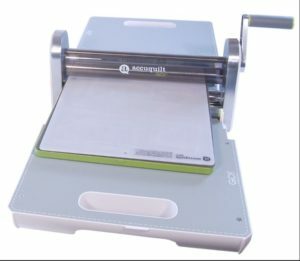 I also noticed that the machine would feed the fabric unevenly. I thought I noticed it because I was used to the DC5100, which uses newer technology. I could live with these annoyances, but when the machine stopped working completely, I was had to do something. One day, I turned it on, the machine made a horrible noise, so I turned it off. Then it wouldn’t turn on again. I swapped it out for the DC5100 since I needed to progress with the Cargo Duffle prep. 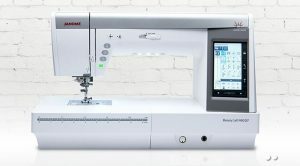 Since the machine not turning on was major, I texted Angie at the Sewing Machine Place, though I had avoided it until then despite noting a few issues. She suggested a few things. A different cord worked for making the machine work but she needed to look at it to see what could be done about the feeding and the light. 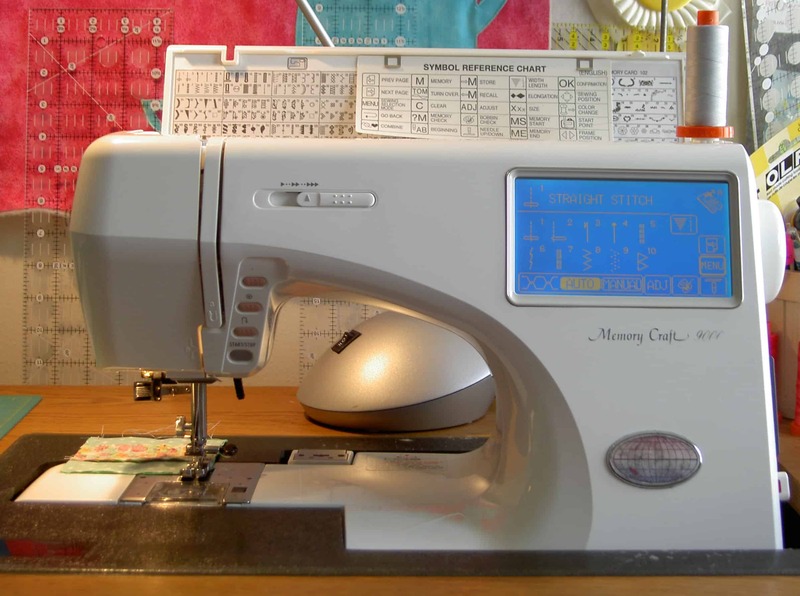 I continued sewing on the DC5100 since I was on a deadline. The YM and I took it in on Tuesday. I needed him for lugging the 50 lb beast. We found a parking spot right by the door, so I really could have dealt with it myself. She checked everything while I waited. I may have to buy a new power cord, but the old one worked at the shop. The big news was that the feeding problem comes from 20 year old feet. I wore out the two feet I use most frequently. I could not believe what I was hearing. Angie told me that the feet are rubbing up against the feeddogs some of the time, especially the quarter inch foot and that, over time, the metal wears through. In the photo, you can see the discoloration (I know the photo could be better, but with the glare of the metal the camera had a hard time focusing). That is a spot where at least the first layer is gone. 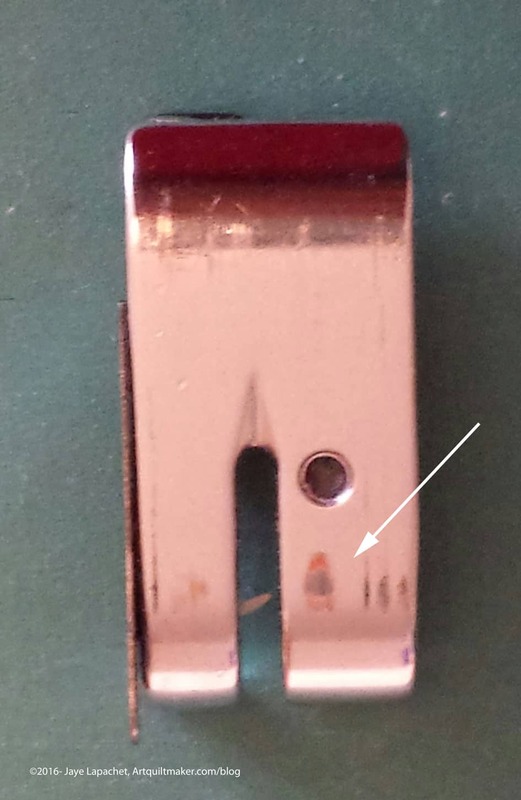 The foot I use for zig zagging (Janome F) had strips of metal on the plastic bottom and had the same problem. 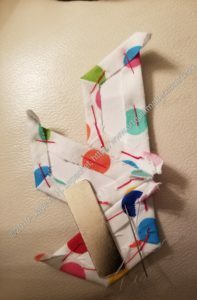 Angie had an F foot so I bought it, but had to go to Always Quilting to get the quarter inch foot. I have been using the DC5100 as I work on the Cargo Duffle so I haven’t had a chance to try out the feeding on the 9k with the new feet. I’ll let you know how it goes. If you are having feeding problems, check the bottom of your feet. You probably remember me bringing home the 9k. It worked and I was really happy except that the needle looked out of alignment and the light bulb was burned out. I called the place that repaired my machine. I felt like an idiot when she, very kindly, told me I could move the needle position. Then she explained that she had had to do a factory reset when she re-soldered all of the connections. This meant that the machine was back to what it was like when I bought it. I didn’t remember ever changing the needle position but that was then and this is now. The machine works well. I don’t have to buy a new one; I am happy. Except for the light bulb. 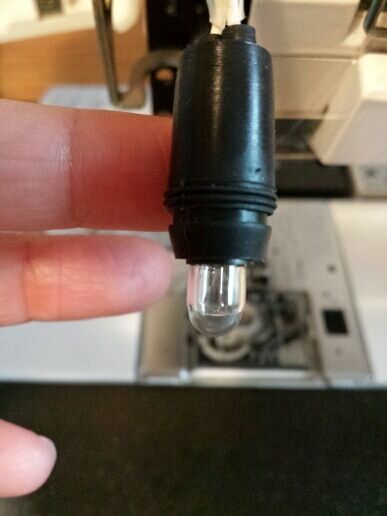 I have an auxiliary bright light over the machine, but it does not shine on the needle. The little sewing I have been doing has been somewhat dark. I asked her about the bulb and she said she would send me one if I told her which one. I was at work; I had no idea. Later that night I looked at the bulb, which I had to find first. I never had to change the bulb before. That may have been the original bulb! I took a photo and meant to call and tell her, but was too busy at work. My last days mean that projects are being heaped on my that nobody ever thought important before. On Friday morning I decided I would drive down to the shop and pick up the bulb so I would be ready for sewing on Saturday. When I got there, I showed the photo. The nice lady, Angie, asked if the bulb had two prongs or a roundy sort of connection. I didn’t know. I just stared at her thinking I’d have to go home with no bulb and sew in the dark on Saturday. She gave me one with prongs. I slotted it in when I got home and turned on the light. It worked and now everyone is happy(mostly me, but also my DH who is happy that I have stopped muttering to myself about incompetent machine repair people and damn light bulbs). Update: sad news. The machine is on timeout again. 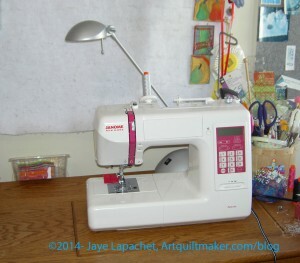 I sewed on and off all day on Saturday with my new light bulb, my newly positioned needle and life was good. Sunday all hell broke loose. The machine started running super fast and then giving me an error message about a bent needle or something caught in the needle area. I changed the needle. No help. I rethreaded the machine. No improvement. I rewound a new bobbin. Same problem. I took off the sole place and cleaned the whole area. It was pretty clean already. Nothing. I took out the bobbin case and cleaned out under there. The problem persisted, so I put the machine on timeout and took out the backup machine again (no knee lift- BAH). I feel like I am in an abusive relationship and this might be the last straw. I am going to look and see if there are any contests at which I can win a new machine.